Back pain is a common problem affecting approximately 1/3 of the UK population each year resulting in about 2.6 million visits to the GP. This will often result in pain killers being prescribed which in some cases will be sufficient to ease the pain but in most cases is just masking the underlying cause. There is a better solution. Research has shown that chiropractic treatment of the low back is highly effective and often superior to conventional medical approaches and in 1996 the Royal College of General Practitioners published a report that recommended manipulation within six weeks of the onset of low back pain. Chiropractors have been successfully treating low back pain for decades without the need for drugs or surgery. Here at Aligned For Life Chiropractic our aim is to find the root cause of the problem and fix it. So what’s causing the low back pain? In most cases it’s a combination of stiffness in the facet and/or sacroiliac joints, muscle spasm and imbalance, ligament sprain and nerve irritation. Sometimes the intervertebral discs can be damaged which often leads to patients suffering from sciatica. By undertaking a thorough history and examination we can diagnose your condition and advise on a course of treatment that will be tailored to your needs. Occasionally there will be a need to refer you for an MRI scan or x-rays to gain further insight into your symptoms. If after a thorough examination chiropractic care is considered unsuitable you will be referred to the correct person. So what exactly can cause low back pain? The intervertebral disc is made of a 3 main sections: the harder cartilaginous outer layer called the annulus fibrosis, the softer inner portion called the nucleus pulposus and the end plates which attach the disc to the vertebral bodies above and below. 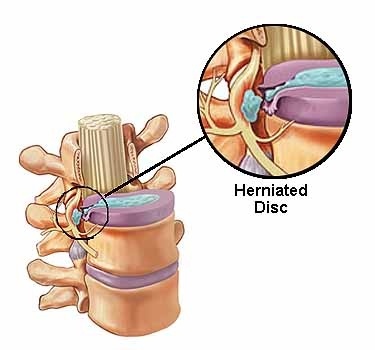 The job of the disc is to provide a small amount of movement between the vertebrae and to resist compressive loads. Damage to the disc is almost always the result of repeated forward bending. It is this repeated forward flexion that causes the inner nucleus pulposus to be forced backwards causing bulging or rupture of the outer annulus fibrosis. In turn this can lead to pressure being exerted onto the spinal nerves leading to what is known as sciatica. The idea that discs slip is incorrect, they either rupture or bulge. Pain from damage to the disc is believed to be caused by micro fracturing of the endplates of the vertebrae. The size and shape of discs can vary between individuals and this has a strong influence on its resilience to the number of bends the disc can survive before it leads to a disc prolapse. For example, an oval-shaped disc with a smaller radius is better suited for twisting actions, however, it’s poorer at repeated compressive loading; such a person might make a great golfer but a terrible weight lifter. On the other hand, a limacon-shaped disc is better suited to bear high compression but it succumbs to focal stresses at the back of the limacon with repeated bending; this individual would be better suited to rugby and power lifting and might struggle with golf. The severity of the disc injury will dictate whether chiropractic treatment is suitable. In more moderate cases the use of spinal manipulation (go to the ‘clinical research’ section of the website for evidence of this), McKenzie exercises, exercise rehabilitation and lifestyle advice will significantly aid recovery. Unfortunately, once the disc has been damaged it will never return to its former state and patients will often need to continue with a life-long exercise program and will often benefit from supportive chiropractic care. 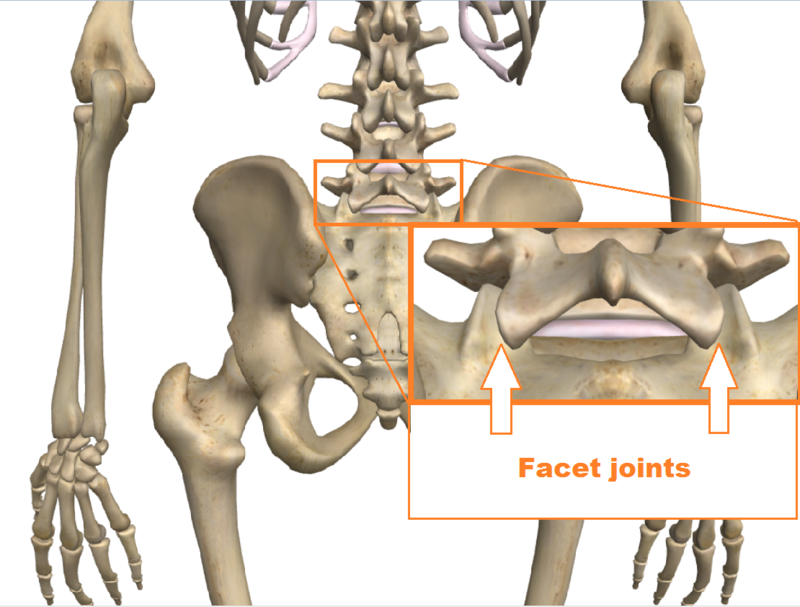 The facet joints are paired joints that are found in the spine, one pair at each vertebral level. These joints have opposing surfaces of cartilage and a surrounding capsule that is filled with synovial fluid that reduces the friction between the joint surfaces. The joints allow the spine to move in all different directions. If the joints become stiff then the spine can longer move freely causing inflammation and irritation to the localised nerves. This is a very common condition that we see on a regular basis that is easily remedied with chiropractic treatment. 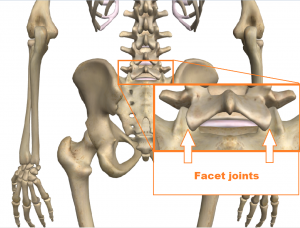 In some cases the facet joints will become worn and exhibit ‘wear and tear’ referred to as osteoarthritis (OA). Even though chiropractic treatment cannot remove the arthritis it can significantly help to restore movement to the facet joints and decrease the pain you experience. Patients who have a significant amount of OA will often benefit from regular care to ensure that their symptoms do not return. The sacroiliac joints are the connection between the sacrum and the ilium. They are strong L or C shaped weight bearing synovial plane joints that have irregular surfaces that interlock providing increased strength and stability. 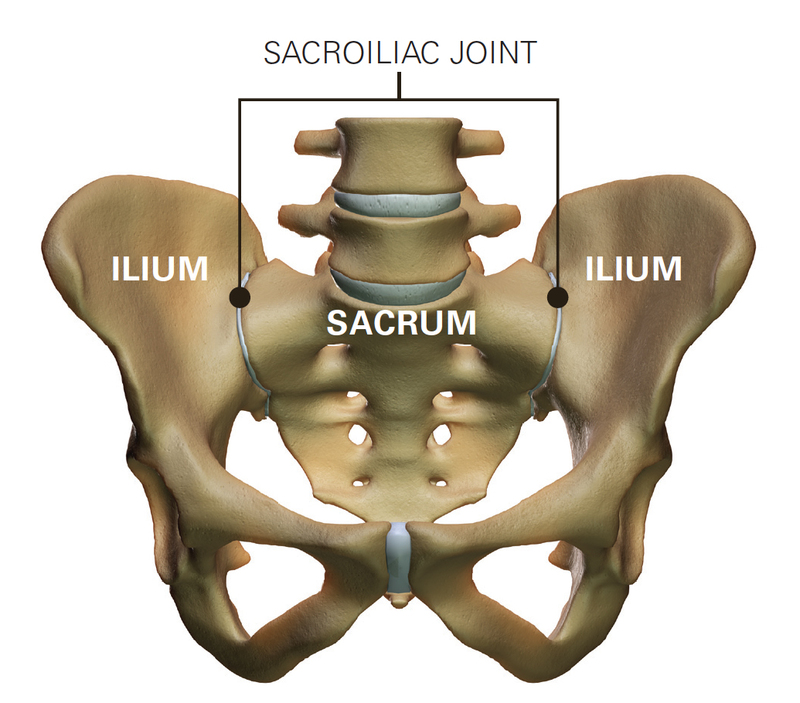 The sacroiliac joints are also firmly supported by some of the largest ligaments in the body. Pain in the joint is often referred to as sacroiliac joint dysfunction and is usually felt in the buttock area. It is generally considered to be caused by abnormal motion in the sacroiliac joint, either too much motion or too little motion. It typically results in inflammation of the sacroiliac joints and is sometimes known as sacroiliitis. During pregnancy the integrity of the ligament support around the sacroiliac joints is affected as the hormone relaxin is produced. This is an essential part of the pregnancy process as it allows the ligaments to stretch and the pelvis to expand to accommodate the foetus. It can however, lead to sacroiliac joint instability which will occasionally lead to pelvic girdle pain. At Aligned For Life Chiropractic we have been successfully treating sacroiliac joint issues for many years with great results. Whether they are unstable and need strengthening or whether they are restricted and tight and need loosening off we can help. Spondyloarthritis is the name for a family of inflammatory rheumatic diseases that cause arthritis. It is a type of arthritis that attacks the spine and pelvis, and in some people, the joints of the arms and legs. It can also involve the skin, intestines and eyes but the main symptom in most patients is low back pain. Symptoms present in two main ways. The first is inflammation causing pain and stiffness, most often of the spine and pelvis but occasionally in the arms and legs. The second type is bone destruction causing deformities of the spine and poor function of the shoulders and hips. The most common form of spondyloarthritis is ankylosing spondylitis which mainly affects the spine and pelvis and is an auto-immune disorder. Ankylosing spondylitis is hereditary with a variety of different genes that can cause it but the main one is HLA-B27. Ankylosing spondylitis tends to start in the teens and 20s and affects males 2-3 times more than females. Family members of affected people are at higher risk, depending partly on whether they inherited the HLA-B27 gene. Correct diagnosis requires a physician (usually a rheumatologist) to assess the patient’s medical history and do a physical exam. Blood tests are required to detect for the presence of the HLA-B27 gene however, having this gene does not necessarily mean that you will develop the condition. X-rays of the sacroiliac joints and lumbar spine are important to identify whether there is any bony fusion of the sacroiliac joints (sacroiliits) or vertebrae (bamboo spine). If X-rays do not show changes, but the symptoms are highly suspicious, an MRI or bone scan is often beneficial as they pick up early signs of the condition. Unfortunately AS is a permanent condition but chiropractic treatment can help as a structured exercise program and joint mobilisation can help to maintain joint flexibility and delay or stop joint fusion. There is no compelling evidence to suggest that changes in diet can help with conditions such as AS. However, it would seem logical that an inflammatory condition like AS would benefit from a non-inflammatory diet. Reactive arthritis (formerly known as Reiter’s syndrome) – this can lead to joint pain, swelling and stiffness and also, conjunctivitis (pain and redness in the eyes), urethritis (pain when urinating). It often starts after an infection and usually resolves within 6 months. Psoriatic arthritis – symptoms often include pain, swelling and stiffness in the joints of the hands, feet, knees, neck, spine and elbows. 2 in 5 people who have psoriasis will develop psoriatic arthritis, it is unclear why some people may suffer with the arthritic condition and some don’t. Enteropathic arthritis/spondylitis – Is a form of chronic, inflammatory arthritis of which the two most common types are ulcerative colitis and Crohn’s disease. The cause of enteropathic arthritis is unclear. It may be due to bacteria that enter the bowel when inflammation damages it. People with HLA-B27 are more likely to have this form of arthritis than those without the gene. The piriformis muscle is found in the buttock and helps to stabilise and control hip rotation. The sciatic nerve passes very close to this muscle and in a small number of people the sciatic nerve passes through the belly of the piriformis muscle. Pain radiating into the leg that worsens with walking or squatting. The symptoms of piriformis syndrome can strongly mimic those of ‘sciatica’ caused by a disc prolapse. So what causes the syndrome? One theory is that altered gait mechanics can cause piriformis muscle tension leading to inflammation and irritation of the sciatic nerve (common peroneal nerve). However, more commonly, piriformis syndrome is secondary to inflammation due to gluteal trauma or spasm. The effect of this inflammatory process on the sciatic nerve is chemical rather than mechanical. Although no general consensus about the aetiology (cause) and pathophysiology of piriformis syndrome exists, we often attribute this syndrome to a specific mechanism involving the sciatic nerve; such as blunt trauma to the buttocks that results in haematoma formation (bruising) and subsequent scarring between the sciatic nerve and piriformis muscle. Fortunately, piriformis syndrome is straight forward to treat and involves mobilisation of the hip and pelvis, stretching of tight muscles, muscle release techniques and home exercises.